Demi-glace is a rich brown sauce in French cuisine used by itself or as a base for other sauces. The term comes from the French word glace, which, used in reference to a sauce, means icing or glaze. It is traditionally made by combining equal parts of veal stock and espagnole sauce, the latter being one of the five mother sauces of classical French cuisine, and the mixture is then simmered and reduced by half. 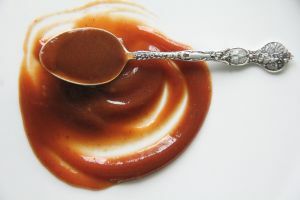 Common variants of demi-glace use a 1:1 mixture of beef or chicken stock to sauce espagnole; these are referred to as "beef demi-glace" or "chicken demi-glace". The term "demi-glace" by itself implies that it is made with the traditional veal stock. The basic recipe for demi-glace is provided by the French chef Auguste Escoffier, who is often considered to have established the method of French cooking as well as codified many of the standard French recipes. Although many recipes for demi-glace give the preparation for the espagnole first, and then the recipe for the brown stock, preparation should actually proceed in the reverse. A basic brown stock should be prepared and when completed, left on the heat to remain very warm. At this point the espagnole is prepared, and when it is finished the brown stock is added in equal portions to the espagnole. Demi-glace keeps very well, about six months refrigerated or almost indefinitely frozen. Due to the considerable effort involved in making the traditional demi-glace, it is common for chefs to substitute a simple jus lié of veal stock or to create a simulated version, which the American cookbook author Julia Child referred to as a "semi-demi-glace". However, even today, many chefs who prepare French haute cuisine use a demi-glace prepared in their own kitchen. Concentrates and mixes, mostly available to professional kitchens, are another way of avoiding the labor inherent in preparing the sauce.